True Eye Allergy is easy to diagnose. The most bothersome complaint from the patient will be itching, itching, and itching. The lids, most commonly, on the nose side, will itch and often swell. The swelling can even cause the skin to crack and swell even more. In Florida, our allergy season is often from Valentine’s Day to May 1st. There is a shorter and less severe season about a month before and after Halloween. But variations do occur. There are many over the counter anti-allergy drops. These are often old prescription drops that have lost their patent. They are cheap but often only give 2 hours of relief. One exception is Zaditor. Zaditor was a prescription drop until just this year. There are many prescription drops that last up to 12 hours and give very quick relief. Most of them have a second mechanism of action that is helpful. When used regularly, they prevent the allergic reaction in the first place (mast cell stabilization). Allergy drops in this class include Patanol (and it’s more expensive once a day cousin Pataday), Elestat, Optivar, and until just recently Zaditor. Most of my patients with severe allergy prefer Elestat or Patanol. Some HMO’s seem to like their patients to try an older type of drop like Cromolyn. This drops stabilizes the mast cell but isn’t a very good antihistamine. So it takes a long time to work. Patients don’t like it as much as other drops mentioned above. For those with more severe symptoms, a short course of mild steroid drops can help–but careful monitoring by your doctor is necessary. It also seems that Restasis can be helpful for severe cases. Oral anti-allergy medicines don’t seem to be that helpful for the eyes. Allergy is often over diagnosed and confused with dry eye. Dry eye doesn’t have itching as the predominant symptom. 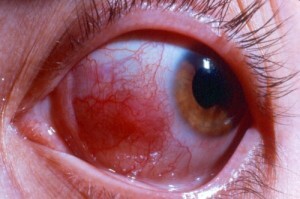 Sometimes the allergy is to an eye drop–such as a contact lens solution or a glaucoma medicine. An exam by your doctor should give insight to those causes. For more information or to schedule an exam call Dr. Mahootchi at The Eye Clinic of Florida in Zephyrhills, 813-779-3338.